I am really beginning to worry about myself lately. I am a 7-year-old Spaniel and live in a nice home with 2 adult humans. Most days I find a nice spot and just nap between walks and meals. If that nice spot was in the hallway, my humans would have to walk around me. It was my nap and I didn't care. Lately, however, I have this urge to follow the humans around everywhere. I can't nap, can't relax, I have got to know where they are every minute. I am really not interested in what they are doing; I just have this urge to keep track of them. Please help, I think I'm losing it! I have heard more and more stories of pets suddenly exhibiting weird behavior. Cats staring intently at an empty space, parrots saying words their humans never taught them, etc. But, I think I have found the problem - psychotronics. 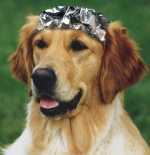 Humans and pets can be susceptable to electromagnetic psychotronic mind-control carriers. Incoming signals, brain control and mind reading can effect us as well as our humans. There is something you can do to protect yourself. Probably the best protection comes from wearing an AFDB. The AFDB, or Aluminum Foil Deflector Beanie, should be worn at all times. The AFDB is effective against incoming signals as well as blocking any attempts to read your mind. According to the ADFB Web site , "Pet AFDB construction is mostly the same as with human AFDBs, however size considerations need to be taken into account and adjusted accordingly. Pets with protruding, highly mounted ears such as cats, dogs, and llamas need to have holes cut into the AFDB to accommodate them. Great care must be taken when making these holes to leave enough extra aluminum to secure the hole around the base of the ear so no stray psychotronic rays leak in." Here is a photo of a friend modeling the AFDB.